I love Indian food. And I love barbecue season. 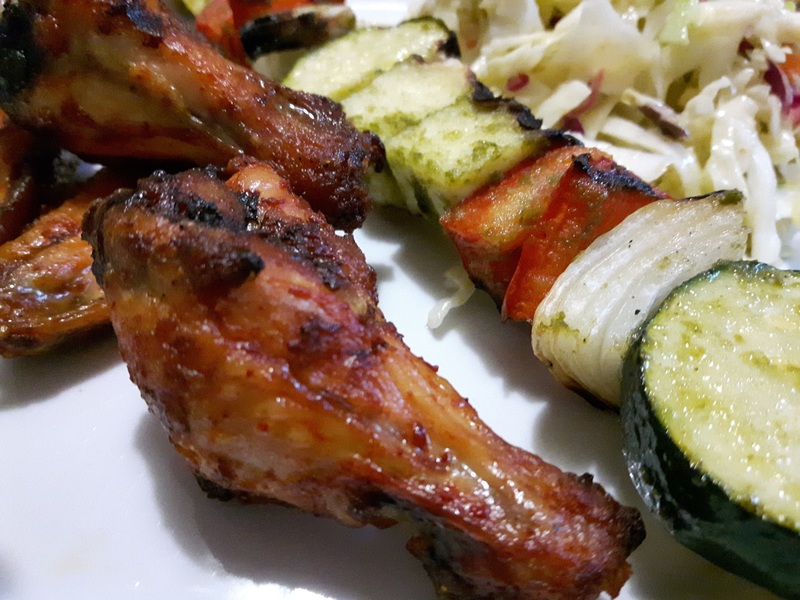 For our first warm and sunny day of the year I decided to make something easy but slightly different: tandoori spiced barbecue wings with some grilled veggie and paneer kabobs in cilantro (coriander) chutney. I served them with some coleslaw, but I wish I had made a dip of some kind to go with either the wings or the kabobs. Still delicious, even without extra sauce. I don't really have any concrete recipes for this post. I hoping it would serve mostly as inspiration if you're feeling bored with the usual BBQ foods. I used pre-made pastes and spice mixes. If you are looking to make you're own, power to you, and let me know if you find a good Tandoori spice recipe! I usually make my own cilantro sauce, so maybe I will add that recipe to this page sometime in the future. Step 1- Marinate the wings for a few hours. 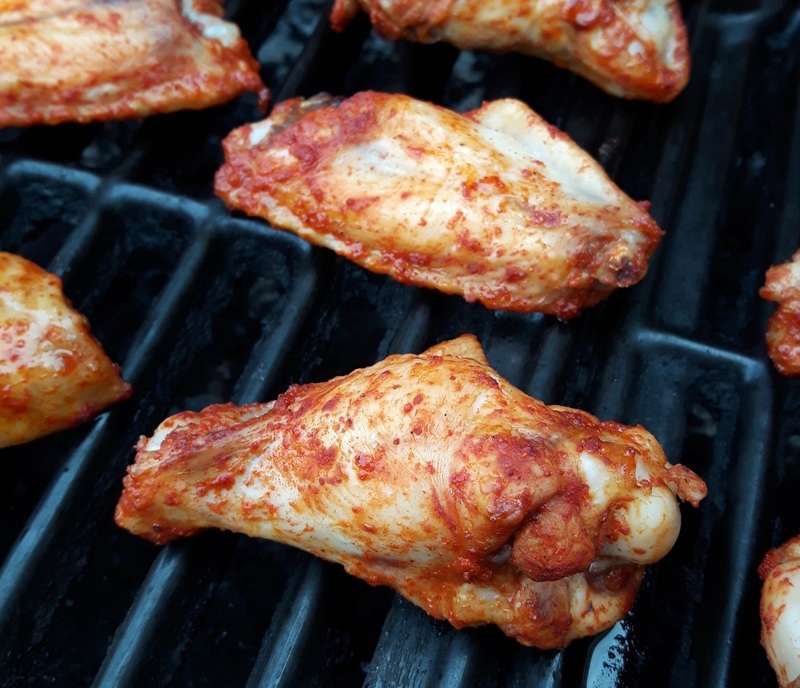 I used some pre-made tandoori spice powder and just rubbed it all over the wings. Keep them refrigerated till you're ready to start cooking them. 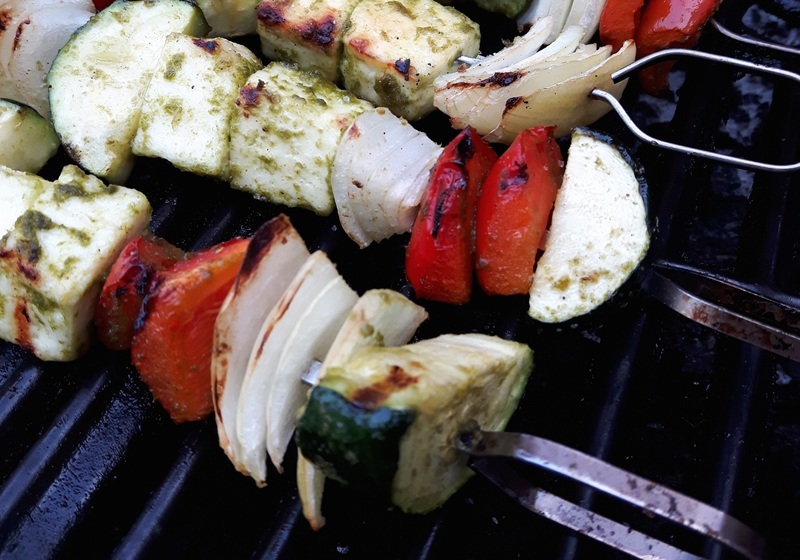 Step 2- Cut up the paneer and any veggies you want on the kabobs. I used onions, red peppers, and zucchinis because that's all I had on hand. Some other good ones would include eggplant, mushrooms, or cauliflower. I cubed the cheese into 1/2 inch pieces. Step 3 - Toss all the veggies and paneer with the Cilantro sauce. I used the Deep brand from my grocery store. Step 4 - Skewer the veggies and paneer cubes and set aside. Step 5- After marinating for a few hours, pre-cook the wings for 15 minutes in the oven on 400 F, then barbecue them till crispy. Keep them warm on the top shelf of the barbecue or in the oven till the skewers are ready. Step 6- Barbecue the skewers, adding a coating of oil if you like, or you can keep brushing them with more sauce. Step 7- Eat! Add sides like naan bread, coleslaw, rice, whatever floats your indian food boat.